Firstly, Miro team introduced Miro Video Player, and some time back Miro developers released a new video converter called “Miro Video Converter” which offers you to convert mostly any video file to MP4, Ogg Theora, Android, iPhone, iPod, PSP format. The best part which I like most about Miro Video Converter is its ease of use and ability to convert the video for mobile devices such as Android and iPhone. 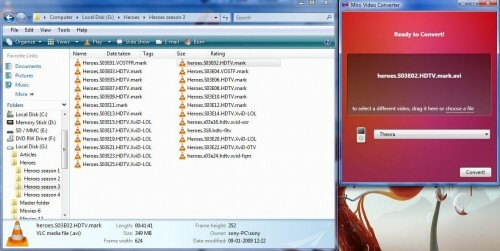 Miro Video Converter gives people an easy, fast and simple way to convert videos. 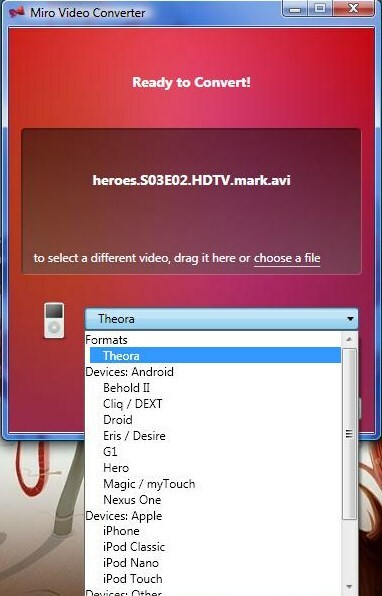 After dragging the file on the converter interface, it will show you the name of the video file. Just select the video format in which you convert from the drop-down list below. After selecting video format, click on “convert” button. Now, it will show you the progress bar and once completed “show file” link will appear on the converter screen. While it’s surely very easy to use, fast and simple video converter. I still feel that it’s lacking advanced settings option for converting video. But I think you should give it a try because it’s free, open source and easy to use software to convert videos. Also it is available for both Windows and Mac versions.